Diagnosis: Black nightshade is an annual herb with erect stems that commonly diverge branching from the base. The plant is generally 1-2 feet (30-60 cm) tall. Leaves are arranged in an alternate pattern and can be highly variable in shape and size. The blades are generally ovate to oval with margins entire. Surfaces can be glabrous to sparsely pubescent. Flower petals are white, star-shaped, occasionally bluish or purple-streaks and with obvious yellow stamens. Immature berries are green and mature to a shiny or dull purplish-black. 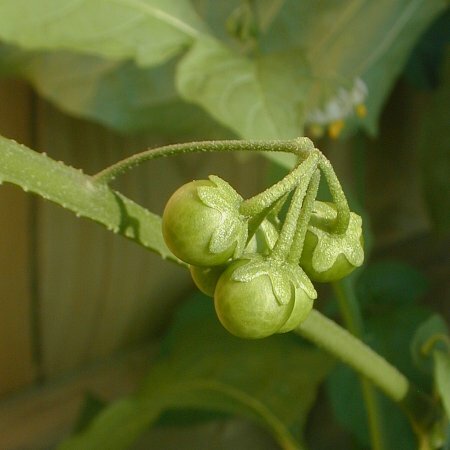 Nightshade flower (left) (http://www.asergeev.com/pictures/archives/compress/2010/851/jpeg/12x.jpg). Green, unripe berries (right) (http://www.illinoiswildflowers.info/weeds/photos/blk_nightshade2.jpg). Flowering period: June through November. Visitors: Bumblebees collect pollen from the flowers. Moth caterpillars and birds feed on black nightshade, but it is generally avoided by mammalian herbivores because of the toxic alkaloid (solanum) that is found in the leaves. Habitat: Moist, open woodlands, prairie ravines, stream banks, roadsides, and waste places. Uses: If the berries are fully ripe (black) and eaten in small quantities, they can be consumed by humans. Green berries contain the toxic solanum alkaloid. Video: Eat the Weeds: Episode 120: The American Nightshade Part 1. 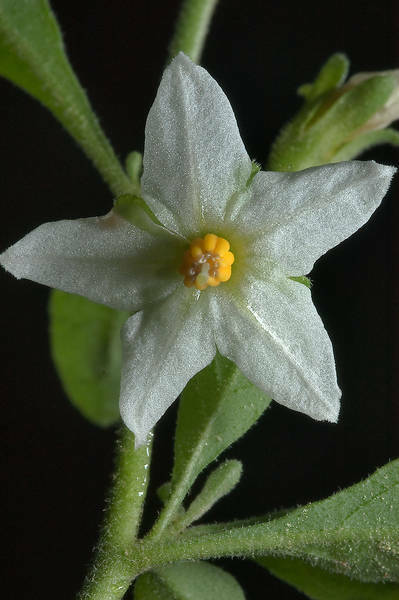 Remarks: This species is also classified as a variant of Solanum nigrum under the name S. nigrum L. var. virginicum L.